The most notable change in version 3.0.0 is that all functionality for handling zip codes has been deprecated and moved to a new package, choroplethrZip. I will have a separate post about that package later; here I just want to highlight changes to the main choroplethr package. This change required me to break backwards compatability with previous versions of the package. This does not happen very often, so I took the opportunity to make other significant changes which had been building up. 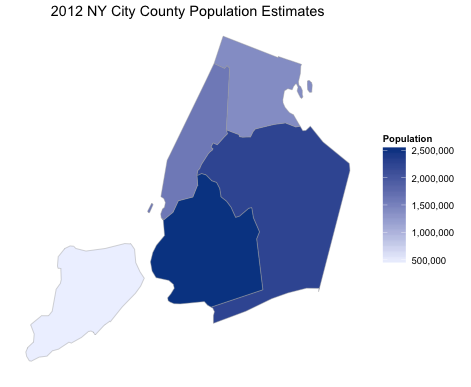 The image is informative: while there are a few high population counties in northern New York, the real population centers are the southern counties around New York City. However, they are so small that it is hard to tell which of the five counties in New York City is the most populous. We can zoom in on those counties by setting county_zoom to a vector of numeric FIPS County Codes. 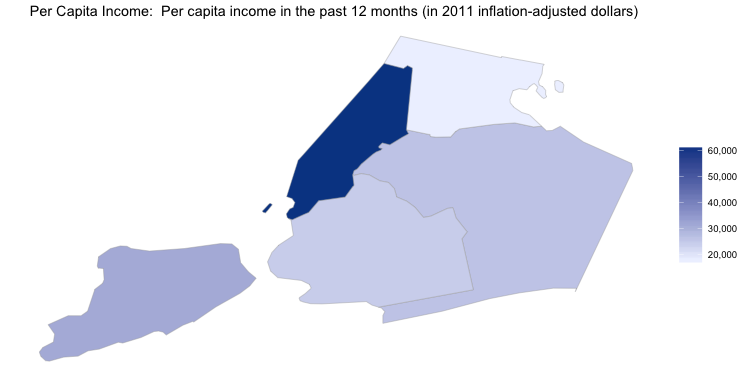 And now it is clear that Brooklyn and Queens are the most populated counties in New York City. The default value is still 7. The choroplethr package used to support visualizing data from the US Census Bureau’s American Community Survey with the function choroplethr_acs. This function has now been broken up into two functions: state_choropleth_acs and county_choropleth_acs. 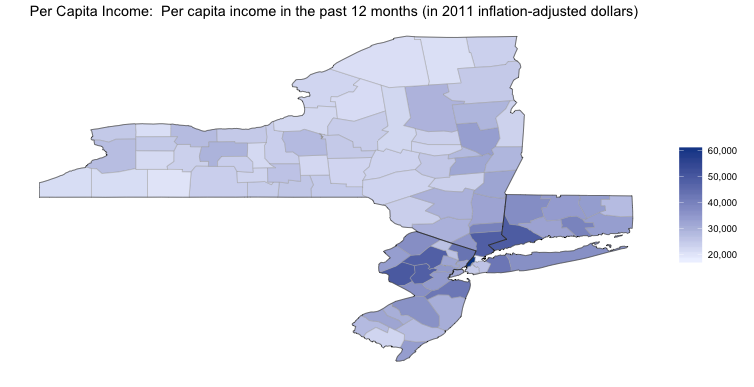 Here are some examples of creating maps of US Per-capita Income. To learn more about the code B19301 (and how to find the codes of other interesting tables), see the article Mapping US Census Data. 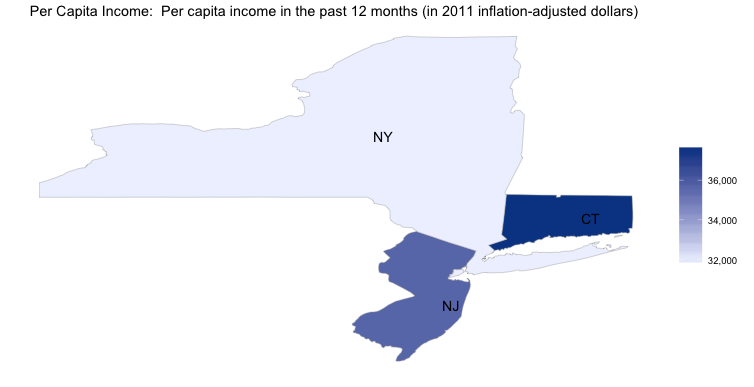 # Per capita income of New York, New Jersey and Connecticut. As always, if you create any interesting maps using choroplethr please consider sharing them with me either via twitter or the choroplethr google group. To leave a comment for the author, please follow the link and comment on their blog: Just an R Blog » R.